In 1955, Maharishi Mahesh Yogi began to offer to the world the knowledge of the ancient Vedic wisdom of the Himalayas. He introduced the simple, natural, and universal Transcendental Meditation technique to help reduce suffering and to bring happiness and fulfillment to all levels of society. 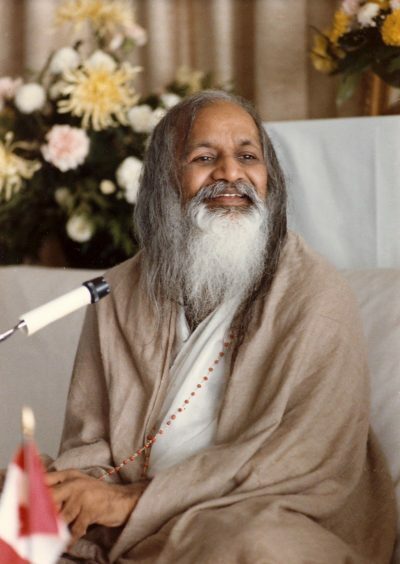 During his life, Maharishi lectured widely and wrote many books about Transcendental Meditation. In 1971, he founded Maharishi International University (renamed Maharishi University of Management in 1993). Maharishi developed Consciousness-Based℠ education so that students can develop their full creative potential, and thereby enjoy success and happiness in all aspects of their lives. Self-knowledge is at the heart of an MUM education. By directly experiencing their innermost nature through the Transcendental Meditation technique, students can easily connect knowledge of each discipline to their own lives, and see the underlying unity of all knowledge. With this experience and perspective, all knowledge becomes highly relevant, and is easily applied for success in any field of endeavor. Learn more about student personal development.